The Novotel Times Square has everything a guest could need during an NYC stay – and whether you’re looking for advice on where to dine or need help organising transport, the staff are hugely helpful. The hotel is central, comfortable and contemporary – so perfect for a New York short break! 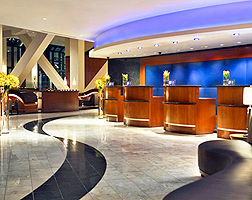 With 24 hour security at the lobby, guests can check in comfortably, regardless of when they arrive. The whole hotel offers WiFi, meaning you can check your emails from the comfort of your room or from the lobby! There’s also a gift shop with New York fun gifts, as well as a range of items you may have forgotten to pack! The hotel’s concierge can help you choose which shows to see, what attractions to visit and the best local places to grab a bite to eat – so make sure you stop by for a chat. The hotel also offers a dry cleaning service if needed. Guests who want to grab a workout whilst away can enjoy the hotel’s fitness centre, which is full of useful gym equipment. For those who think that walking round Macy’s is exercise enough, there’s also a terrace overlooking Times Square where you can sit and watch the world go by!